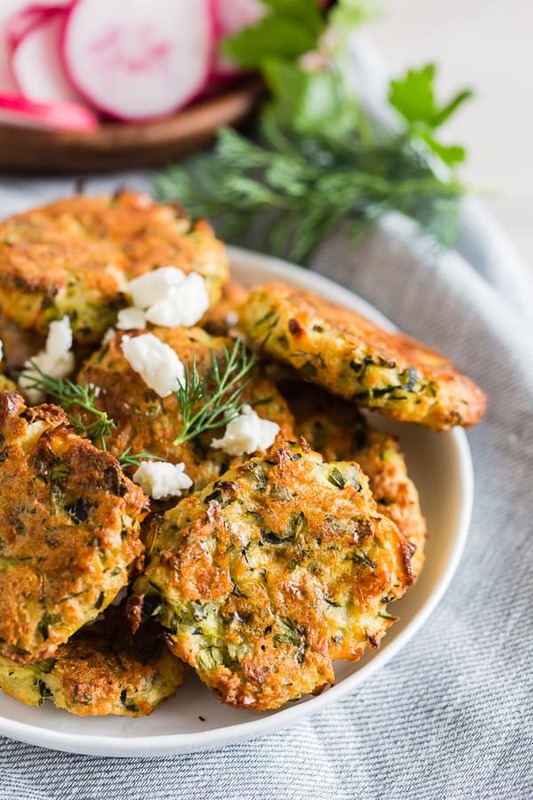 These Greek zucchini fritters are the perfect appetizer and vegetable filled dipper. Made with shredded zucchini, feta cheese and lots of fresh herbs. You’ll love how easy they are to make and how easy they are to devour! This post is sponsored by Sabra. All opinions and thoughts are my own. It’s fritter time! Greek zucchini fritters to be exact. To be honest I had a hard time coming up with a name for this recipe because I couldn’t settle on fritter, tots or bites. I went with fritter. I think it works pretty well for these tasty little bites. Not only are they the perfect little appetizer (or side dish!) but they are PERFECT for dipping and for jazzing up your everyday appetizer spread. I mean, pretzels are a great dipper but let’s face it – these fritters are even better! 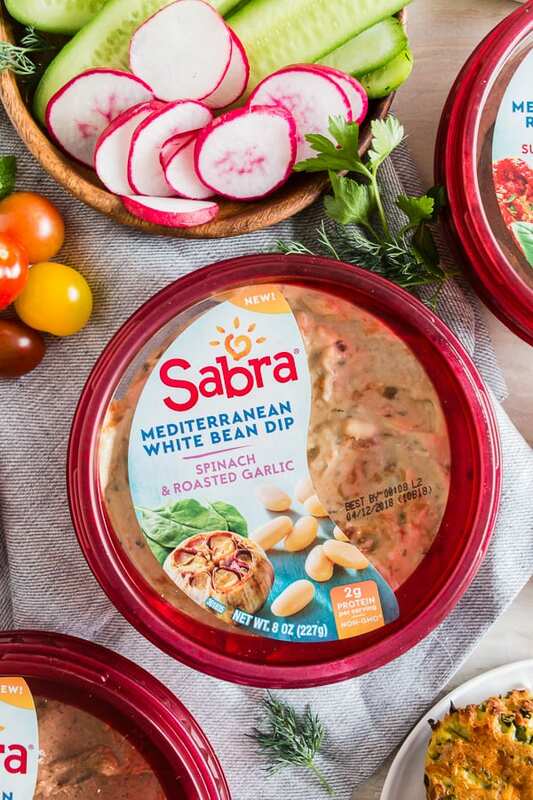 I teamed up with Sabra once again to bring you their awesome new Mediterranean bean dips. Unlike hummus, they are made with either black beans, white beans or red beans. 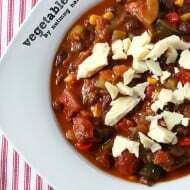 They’re an excellent choice for you all you plant-based diet lovers, packed full of vegetables and beans, 2 grams of protein per serving AND full of Mediterranean flavors. Basically, these dips are the best and you need to get your hands on them on ASAP! Don’t worry, you don’t have to go searching high and low for these babies. You can find them right in your store’s deli dip section. I couldn’t resist making a little dipper for these dips so that is why I came up these Greek zucchini fritters. 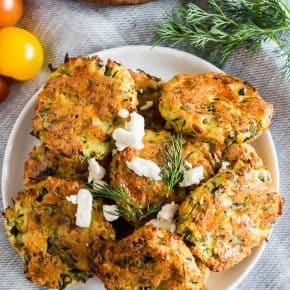 They are PACKED full of grated zucchini, feta cheese, panko breadcrumbs and lots of minced fresh herbs. 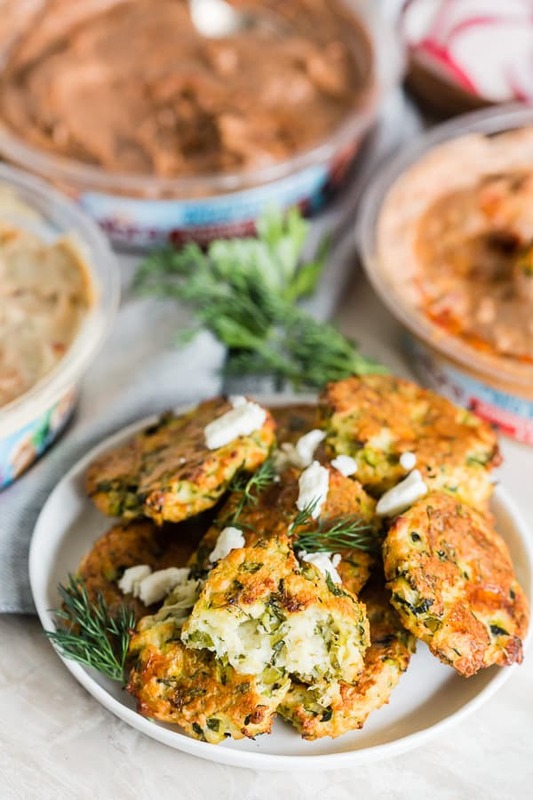 They are delicious eaten straight off the sheet pan but even better when scooping up all that Mediterranean dip flavor. Oh, and they are baked. Yep, no messy frying required! I also think these dips are the perfect addition to ANY party platter. I mean, who doesn’t love dipping? If you’re anything like me I head straight for the dip at parties and don’t look back. OH, and before I forget, make sure you wring out all that extra water in the zucchini before you measure it out. I like to shred it up, put in a dish towel (or strong paper towels) and give it a good squeeze. You’ll be amazed at all the water that comes out. Don’t worry, some water will still remain but you do need a little to help hold together these little fritters. And if you wanted to make these fritters as a side dish you can make the patties larger and bake them for just a bit longer. Oh, and once again, don’t forget to give them a flip in the middle of the baking process. You want that fritter golden and delicious on all sides! Looking for even more delicious appetizers? 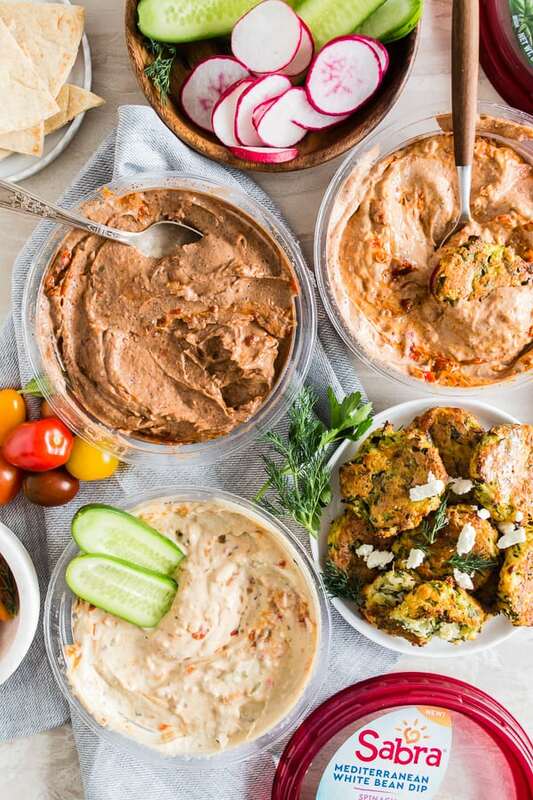 Try my pesto hummus sweet potato bites, charred triple onion dip, tequila lime shrimp phyllo cups, blistered shishito peppers, bacon blue cheese deviled eggs or my creamy chicken taquitos. 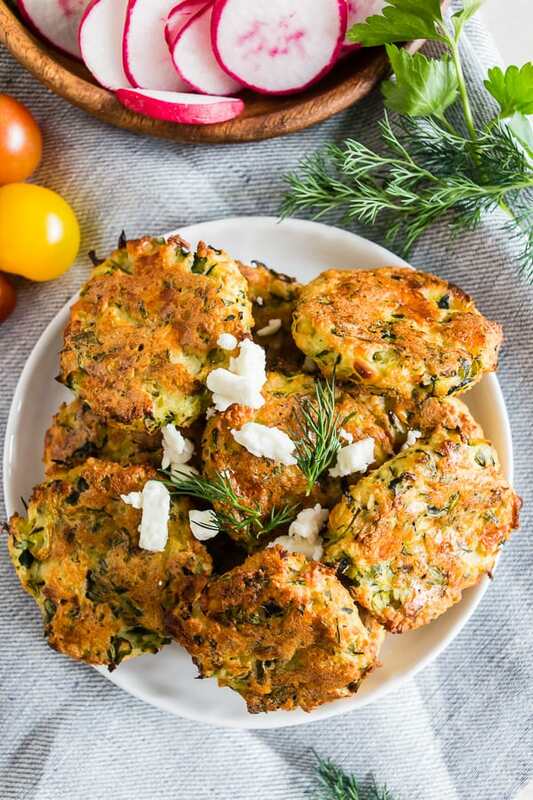 These Greek zucchini fritters are the perfect appetizer and vegetable filled dipper. Made with shredded zucchini, feta cheese and lots of fresh herbs. You'll love how easy they are to make and how easy they are to devour! Preheat oven to 400 degrees and line a baking sheet with parchment paper or Silpat liner, set aside. 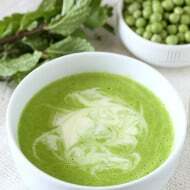 In a large mixing bowl add squeezed zucchini and eggs. Mix together until combined. Add all the remaining ingredients and stir to combine. If the mixture is a little dry let it rest for about 5 minutes to let the zucchini give off a little more moisture. When the mixture is ready (it will appear to be very pasty) use a tablespoon and measure out fritters, roll into a ball and flatten slightly. Place onto the prepared baking sheet. Bake for 15 minutes, flip the fritters over and bake for another 15 minutes. Such a fun way to use zucchini! Love those fritters!! I could make a meal out of this! They look delicious! 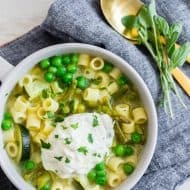 This is the perfect way to encourage my kids to eat more veggies without them even realizing it!! Love it! I have been CRAVING zucchini fritters lately! I can’t wait to make these! 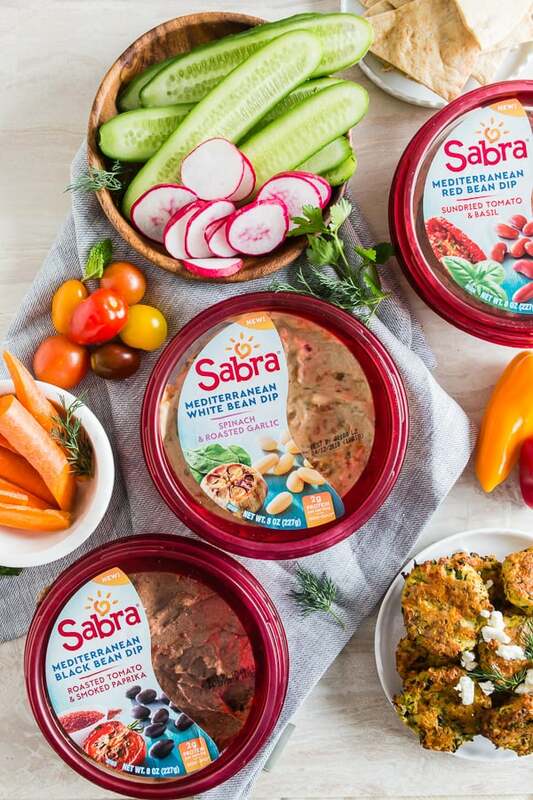 These look seriously delicious….and we LOVE Sabra!!! I LOVE zucchini fritters!! Must try!